Over the August long weekend I attended the Garma festival joining staff from the IERI unit and the transition support team at our education strategy stall. It was great to catch up with so many of our students, parents, teachers and stakeholders. I came away from Garma really pleased about how connected our education services are across North East Arnhem Land. While in Nhulunbuy I had an opportunity to visit the new residential facility site at Nhulunbuy High School and it was great to see the progress with blockwork completed and roofing and some external painting underway. The team of local stakeholders who worked with us to finalise the design are to be commended on the innovation they suggested and the much improved utility this will provide to the future students. To assist the many parents who have expressed their interest in their children attending the facility, we have relocated Mr Nathan Djerrkura to Nhulunbuy to strengthen the services of our Transition Support Unit. Recently we called for nominations for members of our steering committee to guide the start-up of the residential facility and were very pleased with the level of interest shown. My genuine thanks to all the people who responded and we look forward to announcing the make-up of the steering committee shortly. The Head of Boarding position to lead the residential facility has been advertised and we received a large field of quality applicants. We expect to announce the successful applicant in the coming weeks. Just prior to the holiday break we conducted a roadshow to all regions in preparation for implementation of key elements of the Indigenous Education Strategy in schools, and worked with regions to identify schools to trial the new Literacy and Numeracy Essentials Program, Employment Pathways Framework and Social and Emotional Learning program. All trial sites have now been selected and we look forward to further co-designing and refining these programs with our trial school partners. Over 2000 people from across Australia descended on Gulkula in North East Arnhem Land over the August long weekend for Yothu Yindi Foundation’s pre-eminent festival, Garma. Garma attracts a cross-section of people from business, politics, academia and journalism who are keen to learn more about Indigenous people and culture and engage in rigorous debate on current issues. Much of the discussion this year focused on the 40 year anniversary of the Aboriginal Land Rights Act. The presentations and activities at the Education Fair gave attendees an opportunity to gain insights into education in the Territory with a specific focus on initiatives targeting Indigenous children and young people. To kick off the events for the Education Fair at the Garrtjambal Auditorium, participants had the opportunity to hear a traditional Welcome to Country by Yolngu elders and receive an understanding of the educational history and challenges faced by these extraordinary people. Assistant Regional Director Haidee Dentith and Nhulunbuy High School Principal Sabina Smith spoke about the importance of the four local schools working together under the Yambirrpa schools partnership and the direct benefits this was bringing to all students in our schools across the Gove peninsula. AFL legend and Student and Family Support Officer Nathan Djerrkura and NT Young Achiever of the Year Kate Axten gave the participants a greater understanding of the diversity of educational experiences for young Indigenous people across the Territory and the importance of education. “I can see such a difference education can make to the life of a young person”, Kate explained, “which is why working in education and being an Indigenous teacher is so important to me. I want our young people to dream big and to realise that anything is possible if they work hard enough”. General Manager of the Indigenous Education Review Implementation Tony Considine gave a presentation on the various initiatives under the Indigenous Education Strategy and, with the assistance of distinguished MC Marcia Langton, answered a range questions from the audience. 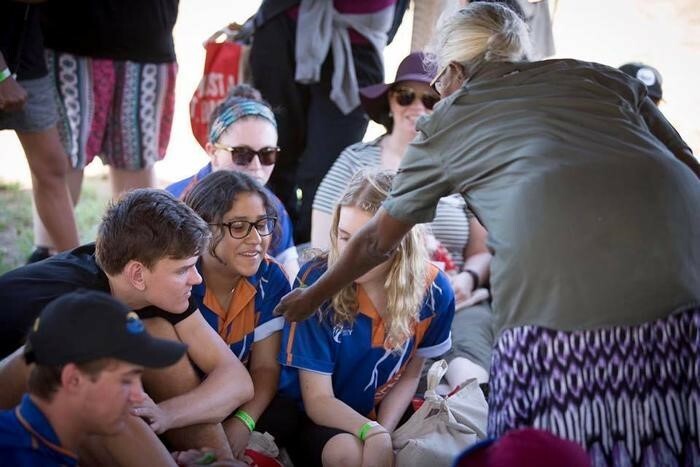 While the speeches were taking place in the auditorium, over 250 students from the Nhulunbuy region and interstate had the opportunity to participate in cultural classes focusing on Yolngu history and culture. With activities ranging from traditional foods to family structures and kinship, the students had a great time learning about and experiencing Yolngu culture. Developed in response to a key recommendation of the Indigenous Education Review, to ensure that Indigenous students can learn to English language, literacy and numeracy through a common mandated teaching and learning program, Literacy and Numeracy Essentials (LANE) will provide a consistent and explicit teaching model across NT government remote schools that is aligned with the Australian Curriculum. Providing a consistent teaching model for literacy and numeracy is particularly important in NT remote schools, where student mobility and attendance has a significant impact on learning. LANE provides a consistent framework to deliver high quality literacy and numeracy programs while providing teachers with flexibility to select a variety of high quality resources to use in their tailored teaching and learning program to suit their students and the school community. The core of the program has been trialled in ten remote schools in the Territory and is now ready to transition to the next phase where those schools work collaboratively with the department to ensure that the curriculum and resources are appropriate for the both students and teachers. It is anticipated that the LANE program will be ready to roll out to schools Territory-wide at the completion of this stage. For more information on the Literacy and Numeracy Essentials program, contact Deborah Hodgkin on 08 8963 5536. The Alice Springs Language Centre is providing greater choice in language education to middle years students through a new Middle Years Indigenous Language Translation Course. The course was launched on Thursday 5 August and provides students the opportunity to gain a deeper understanding of Indigenous languages including learning how to translate between English and Indigenous languages. “There is a very real need in Indigenous communities for workers to be able to translate languages effectively and this course provides students with those exact skills,” Ms Castle said. Coinciding with the launch of the course, over 30 middle years teachers from across the Central and Barkly regions attended a workshop at the Alice Springs Language Centre to learn more about the program. The workshop was delivered by Susan Moore, Indigenous Language Consultant with the Department of Education, and David Moore, an interpreter with the Aboriginal Interpreter Service. As part of the trials conducted last semester, students from Centralian Middle School worked with tech-company iTalk to translate an app for smart phones from English to Arrernte language, which will be available in app stores in coming weeks. Ms Castle hopes to expand the program to schools right across the Central and Barkly regions, and potentially work towards offering vocational education and training (VET) pathways in translation and communication through Centralian Senior College. “I’d love to team up with a registered training organisation and be able to deliver VET certificates in Applied Language studies, to give students in Alice Springs a clear pathway to a career in translation,” Ms Castle said. A new Territory-wide preschool curriculum that is being implemented across all government preschools from Term 3, 2016 has been implemented. Aligned to the Indigenous Education Strategy action to invest in implementing early language and literacy learning programs in preschools, the Northern Territory Preschool Curriculum ensures students are academically ready as well as supporting their social and emotional growth and wellbeing, in preparation for entering formal schooling. In addition to assisting preschool teachers in their development of programs with a focus on literacy, numeracy and English oracy, the curriculum addresses five key areas in child development: identity, connectedness including how to interact fairly and respectfully with others, wellbeing, learning and thinking, and communication. 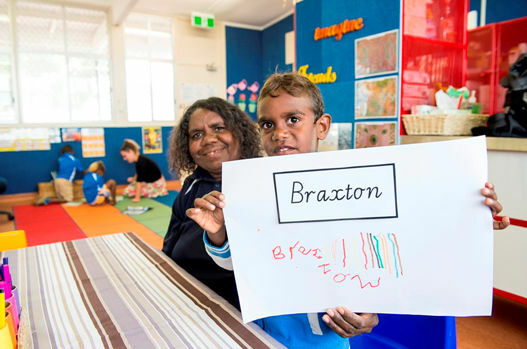 The curriculum focus on developing spoken English will be particularly useful for preschool teachers in remote communities where Indigenous children enrol with English as their second, third or even fourth language. After being involved with the initial trials of the NT Preschool Curriculum, Bakewell Preschool teacher Gwen Fraser understands the benefits that the curriculum will provide. “It’s designed to support teachers to embed learning in play”, Gwen said “and, with the support of the curriculum, the amount of learning that comes out of play is incredible”. The Chief Executive from the Department of Education and senior representatives from the Yothu Yindi Foundation and the University of Melbourne signed a new partnership agreement at the Garma festival that aims to increase educational opportunities for young people and adults across the region of North East Arnhem Land. Working closely with the Melbourne Graduate School of Education, the partnership will enable Master of Teaching graduate students from Melbourne University to have Post Graduate practicum experience in schools across North East Arnhem Land with a view to strengthening the quality of teaching and learning in the region. These placements will be complemented by the development of a recruitment strategy focused on retaining talent and new teachers in the region. “I’m delighted that the Department of Education will be collaborating with the University of Melbourne and the Yothu Yindi Foundation on an initiative that will attract some of Australia’s brightest educators to the region”, Chief Executive Ken Davies said. In addition to teaching placements, the partnership seeks to identify ways to improve foundational education with a specific focus on disengaged young people and adults in the East Arnhem region with low literacy and numeracy levels. Introduced in 2015 as key initiative of the A share in the future – Indigenous Education Strategy 2015 – 2024, Direct Instruction is a teaching model that emphasises well developed and carefully planned lessons. The program is designed around small learning increments and clearly defined and prescribed teaching. It incorporates a clear teaching script and student prompts that eliminate misinterpretations to assist in improving and accelerating learning. The Progressive Achievement Testing (PAT) data comparing Term 1, 2015 to Term 1, 2016 indicates government schools that have been running Direct Instruction in literacy have achieved positive results particularly for students in Years 1 – 4 where, on average, DI school students are improving at a rate up to three times greater than that for “like” school students who are not participating in the Direct Instruction program. To support the implementation of Direct Instruction maths, 88 staff attended a training session at Groote Eylandt on 28-29 July. As the implementation of the A share in the future – Indigenous Education Strategy 2015 – 2024 progresses, so too does the evolution of the important role of our Assistant Teachers. Yuendumu School is an excellent example of how assistant teachers play a pivotal part in influencing teaching and learning programs as well as school operational decisions. Staff meetings include all staff participating in a professional learning session. Topics for these sessions are nominated by the staff and range from ‘how to conduct daily reflections’ to ‘how to plan great bush trips’. Staff also participate in a Learning Together Warlpiri language lesson at the beginning of their weekly staff meeting. Classroom teachers and assistant teachers have joint release time to plan the weekly program together. At these meetings, the roles and responsibilities of the teacher and assistant teacher are determined. Assistant teachers take on more direct teaching responsibilities for Warlpiri language and culture lessons and classroom teachers take on the role of assistant teacher in these sessions. The department has been working with a number of key stakeholders including Associate Professor Helen Cahill from Melbourne University to develop the Northern Territory’s first Social and Emotional Learning (SEL) curriculum. The purpose of the curriculum is to provide a consistent approach to positive behaviour and wellbeing across all schools in the Northern Territory and stems from a key recommendation of the Indigenous Education Review which identified problems associated with student behaviour as a barrier to learning. The trial of the curriculum and resources along with the delivery of professional learning to support the implementation is currently underway in 26 schools across all regions of the NT including at Lajamanu School. In Semester 2, 2016 Lajamanu School will be trialing the NT Social Emotional and Learning curriculum in their Transition to Year 2 classes. Students, staff and community members will have the opportunity to provide feedback to inform the ongoing development of the NT SEL curriculum. The department will provide support to all trial schools including Lajamanu through continued professional learning opportunities, and focus groups with staff, students and community members. For further information regarding this trial and related work, please contact the Senior Manager Wellbeing, Engagement and Behaviour, Michele Oliphant: michele.oliphant@nt.gov.au.